In a large, glass bowl, melt chocolate chips and coconut oil. To ensure the chocolate doesn’t burn, microwave it in 30-second bursts, stirring between until smooth. Dip potato chips into the chocolate. Gently shake potato chips above the bowl, allowing excess chocolate to drizzle off of the chip. Place dipped chips on a piece of parchment paper. Sprinkle with sea salt, if desired. Allow chocolate to harden in a cool location. Store in fridge for up to 1 week. Regular shortening can be substituted for the coconut oil. Sweet Potato Version: Substitute Food Should Taste Good Sweet Potato Chips for the regular chips. The easiest and tastiest idea of the season – chocolate-coated potato chips. Great with sweet potato chips, too! When it comes to the holiday season, you can never have enough snappy-fast recipes. If you’re not running out the door to a party, you’re running home to make and wrap gifts. Time to simplify. Time to take the franticness out of the next few months, pour yourself some wine, and wow yourself with the worlds simplest (and most flexible!) recipe. Need something sweet to share? Check. Need a luscious salty snack? Check. Need to wow your gourmet friends? Check. Need a quick, gorgeous gift? Check. Need to hole yourself away with a bag of these delicacies? Check. Checky Check. 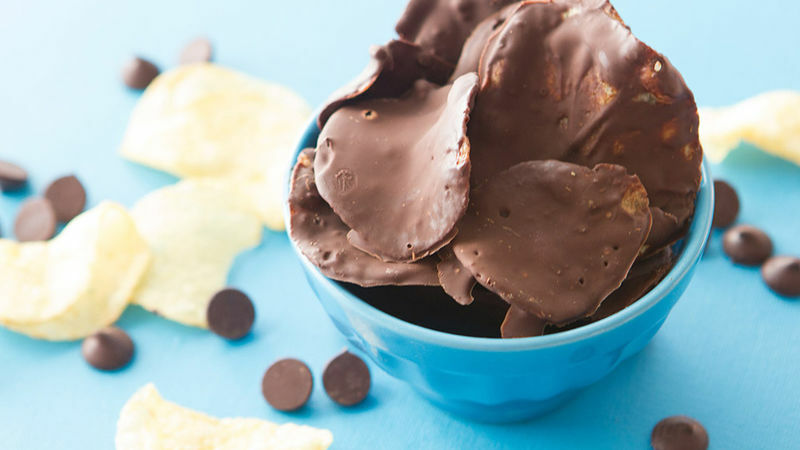 If you haven’t yet discovered the gloriosity that is Chocolate Covered Potato Chips, here's the How To. And get this – you can get all jiggy with this recipe, changing up regular chips for Food Should Taste Good SWEET POTATO chips. Because ... sweet potatoes. Chocolate. This sweet/salty/creamy flavor combo is gonna blow yo’ mind! Start with chocolate chips and potato chips. Melt those chocolate chips with a smidgen of coconut oil. Melt it 'til it looks like this, then stir and stir until it's smooth. ...or put 'em in a bowl to snack on 'em. Holiday survival doesn’t get much better than this!